Safety is the Department of Transportation’s (DOT) highest priority. The Office of Policy Development, Strategic Planning and Performance coordinates with the Department’s modal administrations and other Federal agencies which share responsibility for oversight of transportation-related safety activities. The office provides technical expertise on safety policy matters for the Department’s legislative, regulatory and research programs to the administration and DOT leadership. Engages with stakeholders on issues impacting a wide range of safety issues. Looks for opportunities to advance the Department’s safety mission. The Policy Office coordinates with the Operating Administrations (FAA, FHWA, FMCSA, FRA, FTA, MARAD, NHTSA, and PHMSA) on the safety activities that further the Department’s goal to reduce the number of individuals injured and killed as a result of transportation. The following are areas where the Safety Team works with the rest of the Department to efficiently and effectively perform our safety mission. Human Behavior. Human error, fatigue, driver health, and risky human behaviors such as distracted and drunk driving continue to be a safety challenge in every form of transportation. The Department continues to identify and employ effective interventions that mitigate the effects of human error on safety. Emerging and Automated Technologies. New technologies hold tremendous promise to save lives. The Department is focused on encouraging the development of safety technologies across all modes that will mitigate and minimize human mistakes during transportation. We are working to safely incorporate automated technologies into the transportation system. Data. The Department is becoming more data-driven, and safety data can help identify safety risks, as well as guide policy and evidence-based decision-making. Data helps the Department make better policy choices related to safety, and can help direct resources to safety opportunities that are most beneficial. Federal Relationships with State, Regional, and Local Government. The Department relies on State, regional, and local partners to help ensure transportation safety, and intergovernmental relationships allow us to further extend the Department’s ability to influence safety activities. This includes collaborative partnerships, technical assistance, guidance, standards, and oversight. Regulations and Enforcement. Safety regulations developed under USDOT’s statutory authorities allow the Operating Administrations to have a powerful impact on safety. As performance-based standards become more common, the Department will begin to rely more heavily on safety management systems to address transportation safety risk. Communications with the Public and Stakeholders. The relationships that the Department builds with stakeholders, the regulated community, and the public affect how well our programs work, and are another avenue to influence safety via outreach and education. Below are links to our safety partner’s websites within DOT, as well as links to key safety offices across the Executive branch. The Office of Policy Development, Strategic Planning and Performance develops national transportation policy initiatives with consideration of the potential health effects associated with transportation. The office coordinates with the Department’s modal administrations through the Health in Transportation Working Group to improve leadership and communication across the Department and develop resources and expertise on the relationship between transportation and health. The office facilitates collaboration with other Federal agencies on initiatives relating to transportation and health, including safety, active transportation, and the natural and human environment. Safety data and their use to inform decision and policy making is also an important priority. The advent of “big data” and innovative data analytics present an opportunity to combine traditional safety databases with new data sources in order to better predict safety risk. The Office has been working with the Office of the Chief Information Officer within OST and the OAs to conduct and encourage analyses that identify and illuminate DOT safety risks using multimodal insights that combine DOT and cross-governmental data. One recent project examined the locations of pedestrian fatalities and used other data sources such as roadway characteristics and sociodemographic information to better inform where pedestrian risk is occurring at the neighborhood level. The use of data to inform safety policy decisions will continue through various efforts, including via the internal DOT Safety Council. Learn more on our Safety Data Initiative page. Pedestrian and bicyclist safety is a significant issue that requires close coordination between the multiple Operating Administrations (OAs) within DOT and their safety activities. Pedestrian and bicyclist fatalities have increased in recent years, and in 2016 5,987 pedestrians and 840 bicyclists died on our roadways. The Policy office hosts the Pedestrian and Bicycle Coordinating Committee in order to oversee these safety activities. Work continues to be guided by the Federal Highway Administration’s Strategic Agenda for Pedestrian and Bicyclist Safety, which includes contributions from all relevant modes. 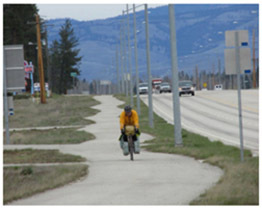 Under Section 1442 of the FAST Act and congressional guidance on Nonmotorized User Safety accompanying the proposed FY 2017 Appropriations bill, DOT released a Safety for All Users report that identifies eight multimodal policy and program areas that can be implemented to help improve safety for pedestrians, bicyclists, and other users. The NTSB is an independent Federal agency charged by Congress with investigating every civil aviation accident in the United States and significant accidents in other modes of transportation – railroad, highway, marine and pipeline. The NTSB determines the probable cause of each accident investigated and issues safety recommendations aimed at preventing future accidents. Our office is responsible for monitoring compliance procedures for handling the NTSB recommendations, and manages DOT’s response to the NTSB Most Wanted List. The Most Wanted List represents the NTSB’s advocacy priorities, and pursuant to law DOT is required to respond to the Most Wanted List with a report that describes the regulatory status of each recommendation on the list. For more information visit our DOT Response to the Most Wanted List web page. The DOT – together with the Centers for Disease Control and Prevention (CDC) – developed the Transportation and Health Tool (THT) to provide easy access to data that practitioners can use to examine the health impacts of transportation systems. It provides data on 14 key transportation and health indicators that measure transportation system performance based on safety, active transportation, air quality, connectivity, and equity to destinations at the State, metropolitan statistical area, and urbanized area geographies, providing users with information on how their community or state compares to their peers. The THT also includes 25 evidence-based strategies that practitioners can use to address health. This information can be used to start a dialogue between public health and transportation professionals, identify areas for improvement and possible solutions, and prioritize transportation investments that will ultimately help improve health metrics related to transportation.